If you are looking for an expert estate agent in the Costa Blanca North (Alicante, Spain) that can offer you a property for sale in Benissa adapted to your needs, go to Spanish Property Sales. We have a qualified team and expert in the real estate sector, which can help you find your happiness in Spain. Benissa is an ideal city to live 12 months a year. Thanks to its excellent annual climate and its distance from the sea, Benissa has become a city much in demand by tourists. There are many people who come to Benissa to enjoy a vacation or a short period of rest. But every year that passes, more tourists decide to buy a house to live the rest of their lives. Benissa brings together all the qualities necessary to live without worry. You will not have to be constantly looking at the sky to see what clothes to put on, you will not have to stop making plans because the rain prevents you ... There are many advantages of betting on Benissa to buy a property of new construction or resale. With Spanish Property Sales you will have the opportunity to discover them little by little. What do you want to integrate your property for sale in Benissa? 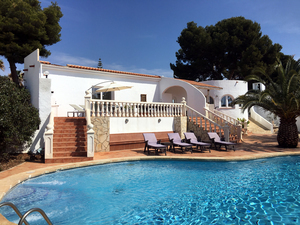 Our estate agents in Spain have been working in the Costa Blanca area for several years. Thanks to their experience they know the best solutions for the welfare of a client. In our property for sale in Benissa you will find everything you need to live comfortably and quietly. For example, in our properties in Benissa you will have access to different models of houses, such as villas or fincas, with their respective private pools, garden, views of the surroundings, etc. We will take care of providing everything you need to start your new journey in Spain with your family, in the best possible way. We can offer you new build or resale properties, but also luxury homes in Benissa. If your intention is to buy an exclusive property, with all kinds of luxury details, our catalog of luxury properties in Benissa is your choice. Our real estate agents will advise you the best housing so that you can fulfill your dream of living on the Costa Blanca. If your vacation period is approaching or you have a few years left to retire, choose our property for sale in Benissa to enjoy it. If you want to know more about the qualities of our houses in Benissa, get in touch with one of our professionals.